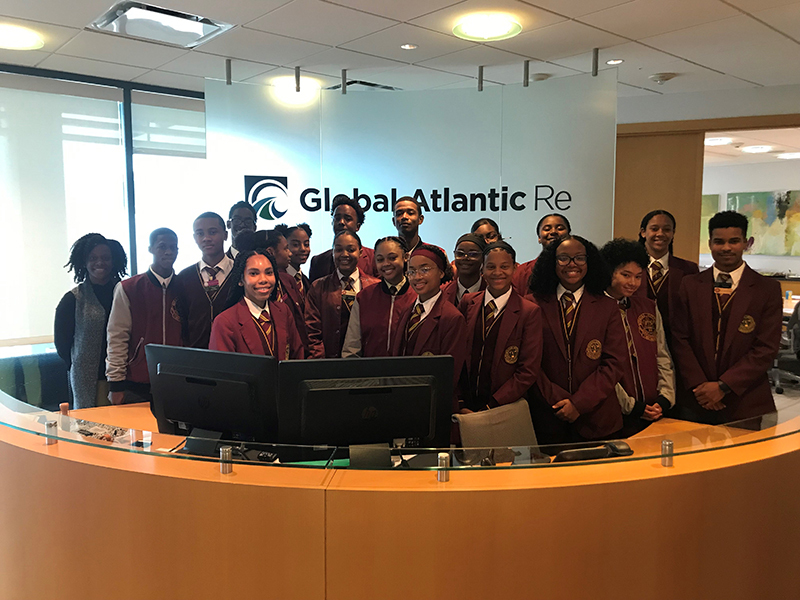 Bermuda International Long Term Insurers and Reinsurers [BILTIR] today held its second Lunch and Learn for 2019, entitled “A Career in the Life Insurance and Reinsurance Industry”, to 20 Bermuda Institute students at the offices of Global Atlantic Re, a BILTIR member company. The programme focused on Bermuda’s thriving life insurance industry and the qualifications needed to obtain employment locally within the field. The session was interactive, providing the students with the opportunity to put questions to the professionals as they gave insight into working in the industry. Students heard from industry guest speakers covering a range of different professions, including actuaries, accountants, risk managers, operations analysts and lawyers. Guest speakers included Scott Silverman, Managing Director and General Counsel at Global Atlantic Re; Scott Selkirk, Managing Director Pricing/Actuary at Somerset Re; Paolo Fiandesio, Risk Manager at Somerset Re; Damian Cooper, Partner/Accountant at PwC; Jerome Boucher, Life Actuary at Sun Life Assurance Co. of Canada; Kiara Somner, Operations Analyst at Global Atlantic Re. The Lunch and Learn programme held today is part of BILTIR’s overall community strategy to grow local talent of potential employees for the life insurance and re/insurance sector. Other BILTIR education strategies include an annual $30,000 scholarship award, a math tutoring programme, and a university-level summer internship programme.